Social media influencers have an incredibly large global following in their area of interest and the ability to shape the attitudes of their audience. They are photographers, writers and people who just figured out how to market themselves. Chris Burkard, photographer and adventurer, has 2.4 million followers - his instagram profile description, “have camera, will travel”. In his Instagram post pictured here, he had nearly 75,000 likes and 600+ comments on his photo from Switzerland. This type of user-generated content is much cheaper than traditional advertising and a more targeted audience. 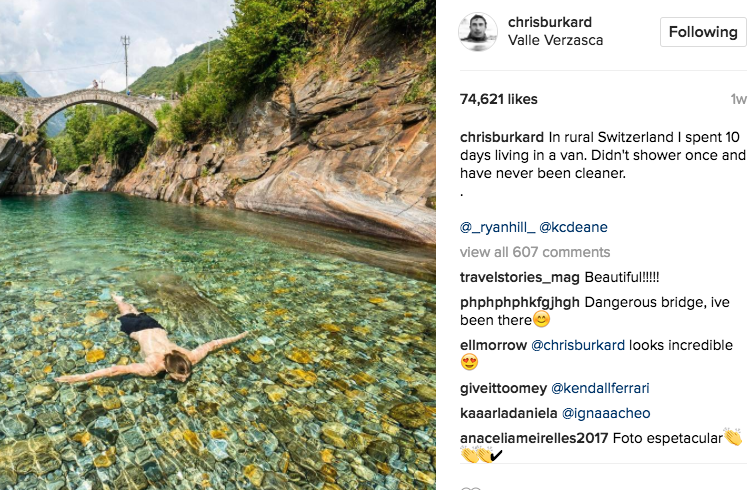 Chris Burkard's 2.4 million followers are probably more likely to travel than the general audience watching a 30 second ad on television. Pros - User-generated content is more influential because of the “testimonial” component. Influencers can better speak to the millennial audience, that same audience travel brands are trying to target. Also, influencers can have a big reach with a small budget. Cons - How much influence do influencers really have? It’s very challenging to track the ROI of an influencer, and there's no guarantee that a positive comment or a ‘like’ converts directly to bookings or sales. Another issue with the influencer trend is the lack of quality. Influencers are not necessarily aligned on your brand’s strategy, positioning, voice and other key factors that create quality content. Native advertising is content created to look and feel like the same content as the platform on which it is displayed. The intention is to promote a company’s product in the voice of the chosen platform and in a way that is educational or informative. For example, the BuzzFeed article (pictured here) is native advertising paid by Sony, but follows the same flow as a normal BuzzFeed article. Pros - You have great content but how will it be distributed? Native advertising allows distribution of content to platforms with greater exposure. Most publishers offer native advertising which provides a variety of platforms to push content. Cons - It can be time-consuming to create this highly crafted content. Native advertising needs to fit the voice and tone of the chosen platform, while simultaneously capturing the audience’s attention. Also, native advertising is not cheap - top tier publishers (think National Geographic) charge anywhere between $50,000 - $200,000 per article. For 2017, video content will account for 69% of all internet traffic. By 2019, 85% of all internet traffic (Cisco VNI Forecast and Methodology, 2015-2020). Video continues to dominate social channels - consumers are now spending about 6 hours per week watching video. In a recent study by Brightcove, 74% of consumers claimed a connection exists between watching a video on social media and purchasing decisions. But it’s not just any type of video that leads to sales conversions. Consumers are drawn to character-driven and emotionally compelling stories. Video storytelling has the best chance at hooking and holding your audience’s attention. So, with the growth of video and storytelling, where should it be positioned for maximum exposure?